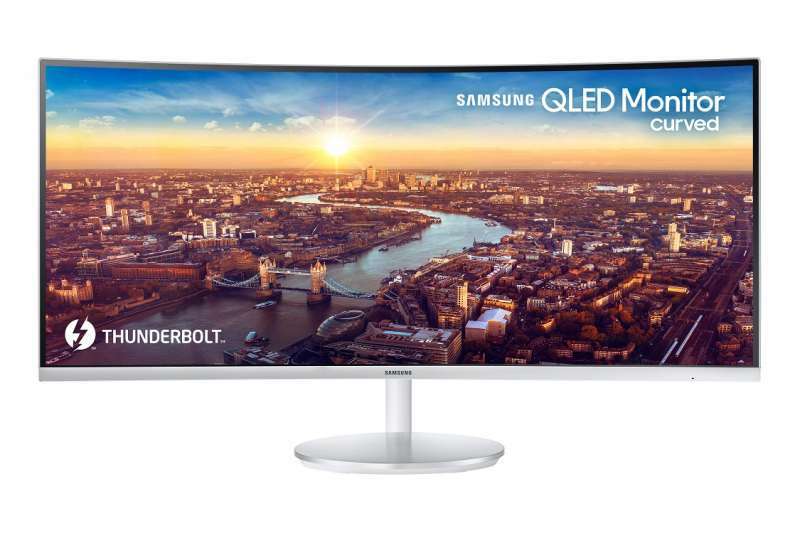 Samsung has added another massive panel to its curved display lineup. The 34-inch CJ791 is the first in the family to feature Thunderbolt 3 connectivity. In addition to feeding display information, Thunderbolt’s increased bandwidth allows the CJ791 to function as a dock. This means that all your peripherals such as mice, keyboards, and webcams can be connected to the monitor instead of your laptop over a single cable. This offers great convenience for on-the-go users who need to frequently move their laptops from the desk. The Thunderbolt 3 interface also provides up to 85W of laptop charging power. The CJ791 features a 3440×1440 ultra-wide QLED panel. Keeping consistent with the other members of the monitor family, the CJ971 features a 1500R curve to cover your peripheral vision for a more immersive viewing experience. With a response time of 4ms, the CJ791 is adequate for fast pace gaming, and with a 125% sRGB color gamut, it’s also perfectly capable as a photo editing monitor. The Samsung CJ791 will be in the spotlight between January 9 to 12 at CES in Las Vegas, Nevada. More details on availability and pricing soon.